Do I have to reset the number of daily inhalations each day? No. 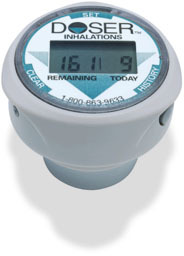 The DOSER will automatically reset the "Inhalations Today" count at midnight each night. In order for the DOSER to set correctly, it is important that you set the DOSER's internal clock when you first activate the DOSER. You will not have to reset the clock after that time. Does the DOSER interfere with the medication, or the way I take the medication? The DOSER does not affect the amount of medication taken or the way the medication is delivered. The DOSER attached to the flat end of the canister (not the delivery end). The DOSER will not change the way that you hold or use your inhaler. Does the DOSER fit on all inhalers? How can I be sure that the DOSER is counting correctly? Accurate counting by the DOSER depends upon accurate inhaler use. Each time you take a puff, press firmly in the center of the DOSER. After each puff the DOSER will beep to confirm that the inhalation was recorded. Consult with your doctor or healthcare provider about proper inhalation techniques. The "Inhalations Today" display on my DOSER reset to 0 in the middle of the day - why? The time was set incorrectly when the DOSER was first activated. The DOSER contains an internal clock that automatically sets the "Inhalations Today" display to 0 at midnight each night. When the DOSER is first activated, the internal clock must be set to the current time. The DOSER then keeps track of the time, and resets the DOSER at midnight. Refer to Step #5 in the Instructions.